This movie embodies very well the essence of the triumph of the human spirit. And it is not done through boxing (such as Rocky) as some of the trailers may suggest, but through friendship and perseverance. However, even though this isn't really a "boxing" movie, per se, there were a few really good boxing scenes shot in a very effective black and white. But to give you a sense of the power that this film possesses, I admit to you the following. I tried very hard to stifle my tears in this movie, but for me this was an impossibility. But what is so strange is that the parts that made me cry were the encouraging and uplifting parts of the film. I can't ever remember in my entire life crying tears of joy (that's usually a woman thing). OK. Let's not talk about that anymore. Ever. The story basically follows the true life story of Rubin "Hurricane" Carter, a black boxer from New Jersey on the verge of winning the middleweight title who is sent to prison for a triple-murder which he did not commit. During his time spent in prison (over 20 years) he constructively channels his frustration into writing a book about his life and about his case. It is this book, when purchased for 25 cents at a book swap by a young man named Lesra who is just learning to read, that eventually leads to Carter's freedom. Lesra and his Canadian guardians, inspired by the book, meet with Carter and join in his struggle for freedom, breathing new life into his appeal attempts. The meat of the story is in how the relationship between Rubin and Lesra is so critical to each of their lives. They bring each other hope and forever shape and change each other's lives for the better. When you get down to it, the story really only has two characters with the others just acting as filler for the setting. He shows us the development of a man going through different stages of life (about 20 years old to 50 or so). He gets us to realize that Rubin "Hurricane" Carter is a great man. He does it all with an amazing display of humanity. He makes Carter a real person instead of a legend. Then there is Lesra Martin (played by Vicellous (VI) Reon Shannon). Vicellous does a great job at contrasting his stark, sobering reality of originally not knowing how to read with his unbridled enthusiasm of reading about and becoming a friend of Hurricane Carter. Which is more important: historical accuracy or emotional content? (A similar discussion can be found in my review of The Insider.) Personally, I feel cheated and somehow lied to if the facts are bent too much in favor of entertainment. And it turns out that in this case, there are a few innacuracies. 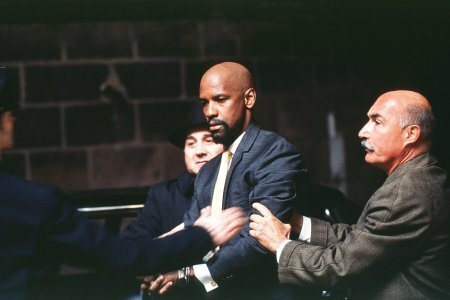 For example, there was no Detective Vincent Della Pesca whose life goal, it seems, was to keep Rubin Carter behind bars. In fact, it was an entire corrupt and racist system that did this to him. Also, there were about 13 Canadians in the commune that hosted Lesra, not the three that the movie presents. Furthermore, the film makes no mention of Carter's later relationship with the Canadians, nor that he married and later divorced one of them. There were also certain scenes and that which, upon reflection, seem to have been made to twist the truth and/or cast a more favorable light upon Carter. Nevertheless, in this case I feel myself being pulled in the other direction. Because what we can really take away from this film is the power of humanity and of hope and of freedom. In this film, the details of the life of Rubin Carter and in the lives of those affecting him really only serve as backdrops to this gripping story of survival and redemption. This morning, I was lucky enough to see an interview with the real Rubin "Hurricane" Carter on the Today Show (he was interviewed by Matt Lauer). I was amazed with this man's charisma, vocabulary, and wisdom. When asked why he wrote the book, he mentioned how during a trial the defendant doesn't really get a chance to defend himself or to make his case/plea. Rather, it is the lawyers who argue over him and a judge who decides which of the opposing lawyers made the best argument. But with the power of the pen, you can make your plea to the entire world...to whomever will listen. Matt Lauer was quick to point out, as I have noted earlier, a couple of the innaccuracies, as I have called them. Specifically, Lauer mentioned the detective character who was "out to get" Hurricane Carter. However, Rubin Carter was quite in tune as to why this was done. He mentioned how the character of Della Pesca was an embodiment (a symbol, if you will) of the corrupt system which imprisoned him and that such an embodiment gives the audience someone to focus on. Also appearing on the Today Show interview (pictured just briefly as he was standing off to the side) was John Artis, who Carter proclaimed was his "personal hero." Artis was also sent to prison along with Carter, convicted of the same crime, because they were in the same car together when they were arrested. Artis spent 15 years in prison (and was paroled before Carter was freed years later) all the while refusing to lie to prosecutors who wanted him to say that Carter did indeed murder those three people. I learned from the show that Artis was taken by prosecutors to his home to spend time with his family and told that he could stay there if he would just lie and say that Carter was a murderer. John Artis stayed true to himself and true to Rubin Carter. What an amazing person! When asked to give a last few words before cutting to a commercial, Rubin "Hurricane" Carter had something along these lines to say: We live in a wonderful and magical world where we can make anything happen if we first think about it. If you first think about it, and keep thinking about it, then you can do anything. Never give up. Woven into the music of the film are recurring snippets of "Hurricane", a song written and performed by Bob Dylan years ago when he was one of those making impassioned pleas for Carter's freedom (Muhammad Ali was another who spoke out in support). However, as the lawyers in the film admit, they "came in with a passion, but eventually faded away." All in all, I would have to say that this movie was extremely powerful and inspiring. You would have to be emotionally dead to not be moved by the film. 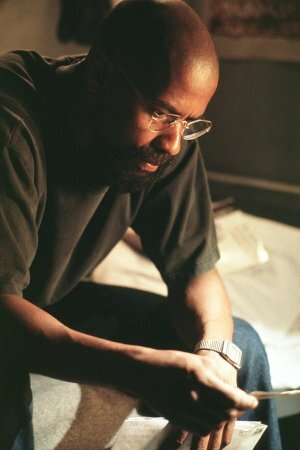 And Denzel Washington's performance is amazing. However, it was not perfect. There are things left out and things added which take away slightly from the truthfulness of the story. And there are questions raised but unanswered (such as "Who are the Canadians?"). But if you can put these things away from your mind and focus on Washington as Carter you will see some of the best moviemaking that has come along in a long time. How would you rate the movie The Hurricane? There have been 14205 people to visit this page since Mon, Jan 17, 2000. And you are the first person to visit this page today!